Home/People and Sound/Examine the Earth/How is sound used to study undersea earthquakes? It is important to know when and where earthquakes occur and their magnitude. Earthquakes are typically detected, measured, and located by seismometers on land. However, for submarine earthquakes (earthquakes with an epicenter under the ocean), land-based seismometers may not provide good coverage for detection and measurement. Smaller earthquakes far away from land may go undetected by land-based seismometers. As the technology changes, more ocean bottom seismometers are being deployed, mostly near shore. 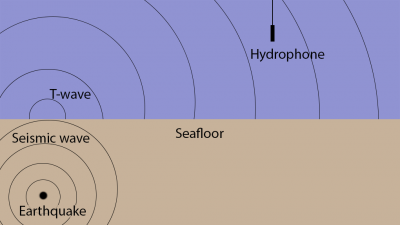 For earthquakes in the ocean, hydrophones can be used to detect and measure submarine earthquakes. Seismic energy from submarine earthquakes is converted into acoustic energy at the seafloor-water boundary. A Tertiary wave (or T-wave) is the acoustic signal from these earthquakes. A T-wave typically has frequencies ranging from 4 to 50Hz. T-waves propagate efficiently in the ocean compared to seismic waves through the earth and can be detected at great distances. Hydrophones can detect an earthquake that is 1.5 to 2.0 orders of magnitude lower than those earthquakes that seismometers typically detect on land. The video below has audio of both earthquake sounds from seismic waves traveling through the earth’s crust and earthquake sounds traveling through the ocean. Watch this video and listen to the March 11, 2011 Honshu, Japan earthquake recorded at a hydrophone located near the Aleutian Islands of Alaska. NOAA Vents Program at Pacific Marine Environmental Laboratory and Oregon State University. The video has audio from both earthquake sounds from seismic waves traveling through the earth’s crust (first) and earthquake sounds traveling through the ocean (second). Location of earthquakes determined using hydrophones may not be as accurate as locations determined by seismometers. The T-wave is created where the seismic waves encounter the seafloor-water interface, which may not be exactly at the epicenter and gives little information about the depth of the earthquake within the Earth’s crust. Hydrophone arrays such as those in the Sound Surveillance System (SOSUS) and the Comprehensive Nuclear-Test-Ban Treaty (CTBT) hydroacoustic monitoring system have been successfully used to detect and monitor earthquakes. For 20 years, researchers have used the SOSUS array in the northeast Pacific Ocean to monitor the ocean off the U.S. and Canadian West Coasts. 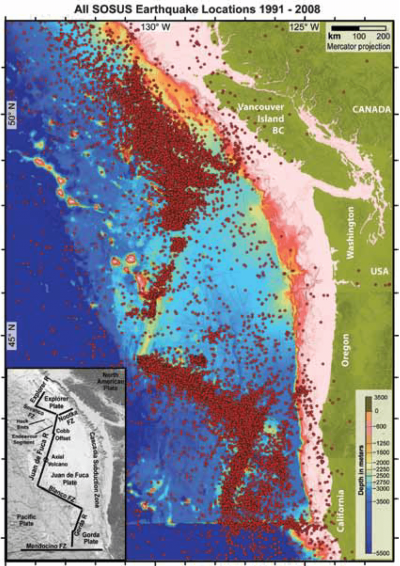 From 1991 to 2011, 47,934 seismic events were detected and located in the northeast Pacific. Data from SOSUS, and CTBT, has led to advances in the understanding of mid-ocean ridge eruption processes. This has improved the understanding of earthquake impacts on hydrothermal systems as well as other tectonic phenomena. US Navy SOSUS-NOAA hydroacoustic monitoring system from September 1991 through January 2011. A total of 47,934 events were located using > 3 hydrophone stations from throughout the northeastern Pacific. Dziak, R.P., S.R. Hammond, and C.G. Fox. 2011. A 20-year hydroacoustic time series of seismic and volcanic events in the Northeast Pacific Ocean. Oceanography 24(3):280–293. NOAA PMEL video – Listen to the Honshu, Japan Earthquake, 2011.